Skillshare is an online learning community designed for both students and teachers of real-world skills. These skills are discovered and learned through the aid of project-based classes. The teachers and students platform provides users an opportunity to access content, presentations, and courses related to wide variety of topics. These topics include design, business, marketing, technology, photography, film, fashion, music, gaming, cooking, writing, DIY. crafts, and more. Professionals who are using the platform as instructors can teach skills by creating and publishing a class. Skillshare aims to empower people in order for them to excel in their careers, improve their lives, and pursue their passion, as well as, the work they prefer. The online learning community ensures that users will be able to access high-quality learning. Skillshare is very useful for students who have different learning objectives. As a robust platform, it offers classes and courses to those who want to learn new sets of skills, those who like to access a refresher for their past acquired skills, and those who want to update their skills through new challenges. It can be observed that Skillshare doesn’t offer one-one-one classes. This is because it focuses on shared learning experience. The platform allows students to share perspectives and insights with one another. It enables them to learn skills by aid of networking and support. They can also give feedback to their online classes. Skillshare is designed to promote and enhance creativity. Students can watch video lessons and create projects to unlock their creativity. In addition, becoming a teacher in Skillshare is just simple. If users like to share their passion and skills with students around the world, they will be able to do that by creating a class, providing a class description, and publishing the class. Through the aid of the Skillshare class creation tool, instructors can create their classes easily. The platform also provides step-by-step guidelines from creating and publishing a class to promoting it by building a channel. Furthermore, Skillshare helps professional, creators, and entrepreneurs earn money. Skillshare offers compensation for teachers, as students enroll to their classes and watch their video lessons. They can also earn revenue for every student they refer who subscribes as premium member. Meanwhile, students will be able to gain unlimited access to a complete catalog of premium classes once they subscribe for premium membership. Classes can also be viewed offline through the Skillshare mobile app for premium members. 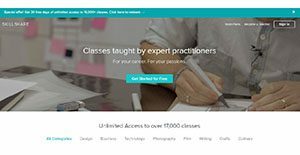 Skillshare also offers free classes to students. Every company has different needs and needs a software that can be customized for their size, type of workers and buyers, and the specific industry they are in. For these reasons, no software can offer perfect tools out-of-the-box. When you try to find a software system, first be sure what you require it for. Read some Skillshare reviews and ask yourself do you desire basic functionality or do you want complex tools? Are there any industry-specific features that you are searching for? Get the answers to these queries to aid your search. There are lots of elements that you need to consider and these include your budget, particular business wants, your organization size, integration requirements etc. Take your time, use a few free trials, and finally zero in on the platform that provides all that you require to boost your firm efficiency and productivity. We realize that when you make a decision to buy Learning Management System - LMS it’s important not only to see how experts evaluate it in their reviews, but also to find out if the real people and companies that buy it are actually satisfied with the product. That’s why we’ve created our behavior-based Customer Satisfaction Algorithm™ that gathers customer reviews, comments and Skillshare reviews across a wide range of social media sites. The data is then presented in an easy to digest form showing how many people had positive and negative experience with Skillshare. With that information at hand you should be equipped to make an informed buying decision that you won’t regret. What are Skillshare pricing details? What integrations are available for Skillshare?